Imagine having your own chlorine factory right in your pool! No more buying, storing or handling packaged chlorine again. 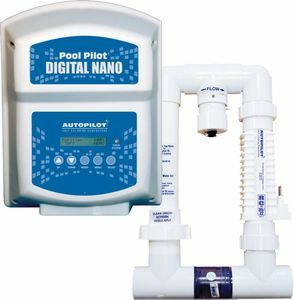 Saltwater Pool chlorination systems are automated salt based chlorine generators designed specifically to produce chlorine right in your backyard pool. With an initial dose of salt to the pool water these salt water generators produce chlorine right in the swimming pool - automatically & continuously. Plus, the softening effect of the salt leaves hair and skin silky to the touch. You get clean, healthy water that is comfortable for swimmers - with far less red irritated eyes, chlorine odors, dry hair or itchy skin. So, sit back and enjoy your pool with the peace of mind that your water is clean and sparkling clear!